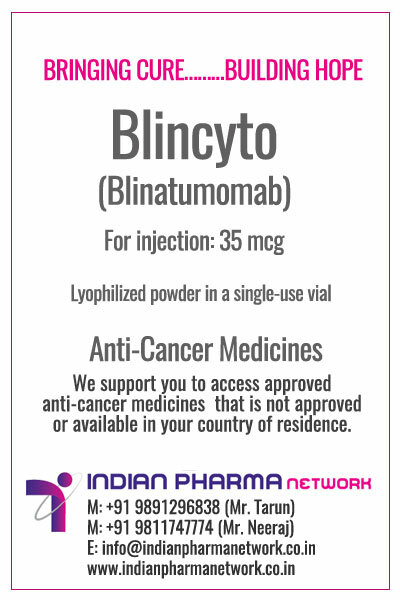 BLINCYTO (blinatumomab) is a prescription medicine used to treat B-cell precursor acute lymphoblastic leukemia (ALL) in patients who still have detectable traces of cancer after chemotherapy. Please call at M: +91 9891296838 / 9811747774 to buy and know more details about the generic FDA approved Generic blinatumomab medicine available in India and its cost price. BLINCYTO is indicated for the treatment of Philadelphia chromosome-negative relapsed or refractory B-cell precursor acute lymphoblastic leukemia (ALL). This indication is approved under accelerated approval. Active ingredients in BLINCYTO are:blinatumomab. Inactive ingredients in BLINCYTO are:citric acid monohydrate, lysine hydrochloride, polysorbate 80, trehalose dehydrate, sodium hydroxide and water for injection. BLINCYTO(blinatumomab) For Injection should be administered under the supervision of a qualified physician experienced in the uses of cancer chemotherapeutic agents. Where can I buy Blincyto? IPN helps patients, doctors and hospitals as a facilitator to import prescription medicine brand Blincyto (blinatumomab) on prescription and Import License in Patient's Name only. For Blincyto or blinatumomab price in India. Please call at M: +91 9811747774 or Email Us to know more details about the medicine and its cost price in India. For Indian Patients, doctors and hospitals Blincyto (blinatumomab) can be made available to patients, doctors and hospitals at Mumbai, Kolkata, Hyderabad, Chennai, Ahmedabad, Delhi, Bangalore, Srinagar, Jammu, Jaipur, Chandigarh, Ludhiana, Noida, Gurgaon, lucknow and Pune and other cities in India. The order will be confirmed only after the receipt of valid prescription of doctor and import permit if applicable. For injection: 35 mcg of lyophilized powder in a single-use vial for reconstitution.